Forged Battalion is a unique multiplayer RTS simulation game from Petroglyph. The effects of climate change have devastated the world and a military force called The Collective has spread across the globe. As part of the resistance group it’s time for you to join the fight. Customize your unique faction in a new take on real-time strategy as you fight in a variety of skirmish, solo, and multiplayer battles. You are not only a commander, but also an engineer, so you have ultimate control over your faction’s units, factories, superweapons and economy. Each battle you win, in each mode, contributes towards your faction’s technology upgrades with different science paths; with over 60 attachments along 4 tiers to unlock, the combinations of equipment and options for field supremacy are almost endless. If you get stuck in the game, check out the video walkthrough and gameplay for the game. 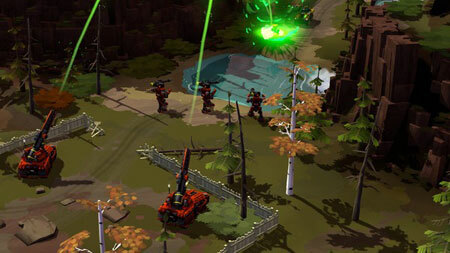 This entry was posted in PC Games, Walkthrough and tagged Forged Battalion Cheats, Forged Battalion Game, Forged Battalion Gameplay, Forged Battalion Guide, Forged Battalion Hints, Forged Battalion Review, Forged Battalion Solutions, Forged Battalion Strategy, Forged Battalion Tips, Forged Battalion Walkthrough by Marvin. Bookmark the permalink.